In this photo taken Oct. 2, 2016, Ethiopians chant slogans against the government during their march in Bishoftu. Dozens of people in the Oromia region were killed that day in a stampede when police tried to disrupt the protest. 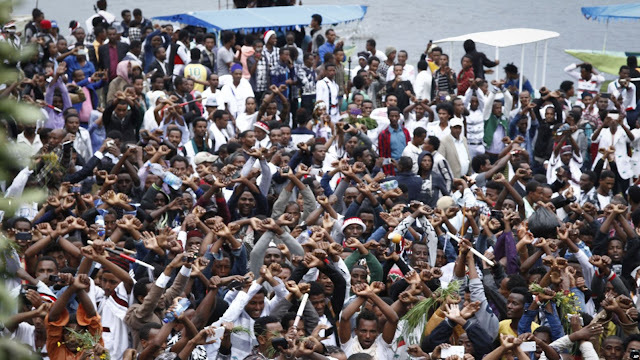 At least 10 people have been killed and 20 others wounded during violent protests Thursday in the town of Ambo, in Ethiopia's Oromia region, after federal security forces fired on the demonstrators. The latest protest — which follows on more than a year of deadly protests in the region between November 2015 and December 2016 — was triggered by recent shortages of sugar. The local head of communications, Gadisa Desalenge, told VOA that the federal and special elite "Agazi" forces, who were deployed to the area early Thursday, were responsible for the deaths. Desalenge also told VOA that some of the protesters, "infuriated by the killings," set several trucks on fire. VOA Horn of Africa service contacted the Ethiopian government for comment, but so far has not received a reply. Meanwhile, the U.S. embassy in Ethiopia issued a statement acknowledging "deeply disturbing reports of violence and deaths in Ambo." Embassy spokesman Nicolas Barnette told VOA that U.S. diplomats are watching the situation closely. Embassy staff are restricted from traveling to Ambo without special permission, and U.S. travelers already in the area have been warned to take caution. Last year’s protests in Oromia were sparked by government plans for a development scheme that opponents said amounted to a land grab. Nearly 700 people were killed in one bout of unrest last year.